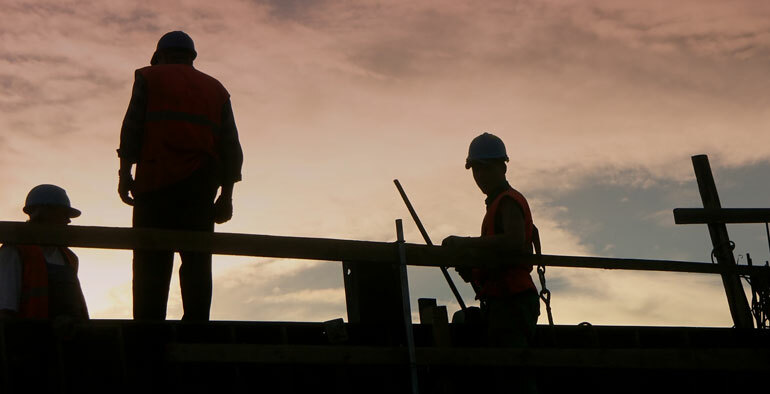 New construction starts in October dropped 9% to a seasonally adjusted annual rate of $742.9 billion, pulling back after a 14% jump in September, according to Dodge Data & Analytics. 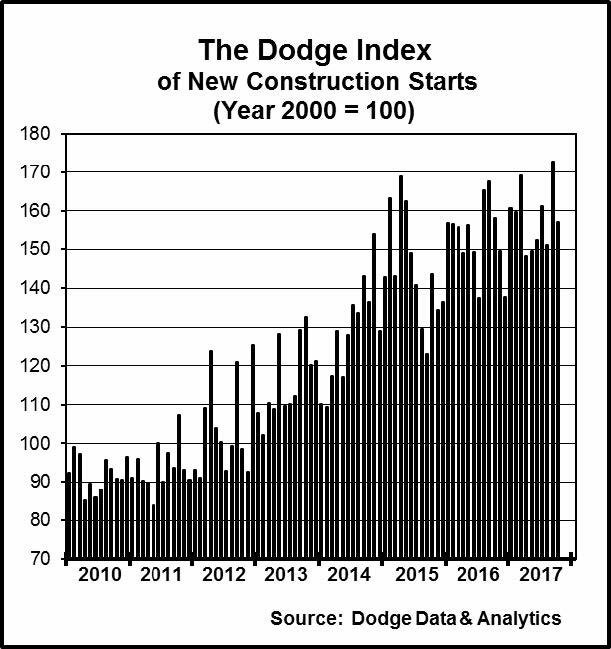 Over the past two months the pattern for total construction starts was shaped by nonresidential building, which fell 30% in October after soaring 37% in September. Although nonresidential building in October did include the start of several very large projects, led by the $1.1 billion new ballpark for the Texas Rangers in Arlington TX, they were not the same magnitude as the three exceptionally large projects entered as September starts – a $6.0 billion ethane cracker plant in Pennsylvania, the $4.0 billion Delta Airlines new terminal facility at LaGuardia Airport in New York NY, and the $1.7 billion 50 Hudson Yards office tower in New York NY. Residential building in October slipped 1%, due to a slower pace for multifamily housing. Running counter was a sharp 27% increase for nonbuilding construction, which was lifted by the start of the $3.0 billion expansion of the Atlantic Sunrise natural gas pipeline in Pennsylvania and Virginia. For the first ten months of 2017, total construction starts on an unadjusted basis were $631.2 billion, up 1% from the same period a year ago. The year-to-date gain for total construction was restrained by a 38% drop for the electric utility/gas plant category. If the electric utility/gas plant category is excluded, total construction starts during the first ten months of 2017 would be up 4% relative to the same period a year ago. Nonresidential building in October was $258.7 billion (annual rate), down 30% after the 37% hike reported in September. The manufacturing building category dropped 67% following its six-fold jump in September that featured the start of the $6.0 billion ethane cracker plant in Pennsylvania. October did include several large manufacturing plants, such as a $675 million polyethylene production plant and a $450 million oil refinery, both located in Texas, but they were not close to matching the size of September’s ethane cracker plant. The institutional categories as a group in October fell 36% following a 25% increase in September that featured the start of the $4.0 billion new Delta terminal at LaGuardia Airport. Transportation terminal work was down 82% in October, and declines were also reported for educational and healthcare facilities. The educational facilities category dropped 29% in October, despite the start of such projects as a $180 million building renovation at the University of Connecticut in Storrs Mansfield CT, a $134 million innovation complex in Providence RI, and a $101 million high school in Little Rock AR. Healthcare facilities fell 21% in October, as only two projects valued at $100 million or more reached groundbreaking, compared to four such projects during September. On the plus side, the amusement and recreational category soared 121% in October, featuring the start of the $1.1 billion retractable roof ballpark for the Texas Rangers in Arlington TX and a $240 million expansion to the Lexington Convention Center in Lexington KY. October gains were also reported for religious buildings, up 20%; and public buildings (courthouses and detention facilities), up 15%. The commercial categories as a group were able to advance 10% in October, even with a 14% retreat for office buildings from September that included the $1.7 billion 50 Hudson Yards project in New York NY. The decline for the office building category was limited by the October groundbreaking for several noteworthy projects, including the $440 million State Farm Park Center office complex in Dunwoody GA, the $331 million office portion of the $570 million Rainier Square mixed-use building in Seattle WA, and a $150 million data center in Allen TX. Store construction in October improved 34% from a subdued September, while new warehouse construction grew 27% with the help of a $235 million warehouse building in Staten Island NY and five Amazon distribution centers located in North Randall OH ($177 million), Orlando FL ($132 million), Thornton CO ($107 million), Portland OR ($85 million), and Troutdale OR ($64 million). Hotel construction in October strengthened 32%, with the boost coming from the start of a $170 million hotel in New York NY, the $148 million expansion of the Pala Casino Spa and Resort in Pala CA, and a $90 million renovation project at the Flamingo Hotel in Las Vegas NV. Residential building in October receded 1% to $295.9 billion (annual rate), continuing to hover within the narrow range that’s been reported for the past six months. Multifamily housing dropped 3% in October, as there were four large multifamily projects valued each at $100 million or more that reached groundbreaking compared to seven such projects in September. The large October multifamily projects were a $445 million multifamily building in New York NY, a $150 million apartment complex in Newport Beach CA, the $138 million multifamily portion of the Rainier Square mixed-use development in Seattle WA, and the $115 million River Landing apartment complex in Miami FL. In October, the top five metropolitan markets ranked by the dollar amount of multifamily starts were – New York NY, Miami FL, Washington DC, Seattle WA, and Los Angeles CA. During the first ten months of 2017, the top five markets ranked by the dollar amount of multifamily starts, with their percent change from a year ago, were – New York NY, down 1%; Los Angeles CA, down 13%; Chicago IL, down 23%; Washington DC, down 13%; and Atlanta GA, up 26%. Metropolitan areas ranked 6 through 10 during the first ten months of 2017 were — San Francisco CA, down 2%; Miami FL, down 50%; Boston MA, down 20%; Seattle WA, down 20%; and Dallas-Ft. Worth TX, down 37%. Single family housing held steady in October, continuing to stabilize after losing momentum in early summer. During the first ten months of 2017, the pattern by five major regions for the dollar amount of single family housing was the following — the South Atlantic, up 11%; the South Central, up 8%; the West, up 7%; the Midwest, up 5%; and the Northeast, down 1%. Nonbuilding construction in October was $188.2 billion (annual rate), up 27% from the previous month. The public works categories as a group climbed 51%, with the boost coming from a 506% surge for the miscellaneous public works category that includes such diverse project types as pipelines, mass transit, and site work. The largest miscellaneous public works project entered as an October start was the $3.0 billion expansion to the Atlantic Sunrise natural gas pipeline in Pennsylvania and Virginia. Also entered as an October start was the $750 million Epic natural gas pipeline in Texas. During the first ten months of 2017, natural gas and petroleum pipeline starts were reported at $20.2 billion, up 83% from the same period a year ago. Also boosting the miscellaneous public works category in October was the $825 million airport guideway and rail station project in Pearl Harbor HI, the $477 million Canarsie Tunnel rehabilitation project in New York NY, and a $444 million portion of California’s high-speed rail project in the Bakersfield-Visalia area. If the miscellaneous public works category is excluded, the remaining public works categories as a group would have been down 9% in October, as the result of a 13% drop for highway and bridge construction as well as a 46% plunge for sewer construction. Despite the decline, highway and bridge construction in October did see the start of several noteworthy projects, including the $756 million Chesapeake Bay Bridge Parallel Tunnel in Virginia Beach VA and a $259 million highway construction project in Houston TX. During the first ten months of 2017, the top five states in terms of the dollar amount of highway and bridge construction starts were — Texas, California, Florida, Pennsylvania, and New York. States ranked 6 through 10 were — Virginia, Ohio, North Carolina, Georgia, and Illinois. On the plus side for public works construction in October were gains for river/harbor development, up 35%; and water supply construction, up 21%. The electric power and gas plant category in October dropped 55%, retreating sharply after a moderate 10% gain in September. Large power plant projects that reached the construction start stage in October were led by two wind farms in Texas, valued at $330 million and $250 million respectively. The 1% increase for total construction starts on an unadjusted basis during the first ten months of 2017 was due to mixed behavior by the three major construction sectors. Nonresidential building increased 8% yearto- date, with institutional building up 18% while commercial building slipped 7%. The manufacturing building category was up 31% so far in 2017, aided by this year’s rebound for petrochemical plant starts. Residential building grew 1% year-to-date, with an 8% gain for single family housing slightly outweighing a 13% drop for multifamily housing. Nonbuilding construction year-to-date fell 7%, the result of a 5% rise for public works and a 38% drop for electric utilities/gas plants. 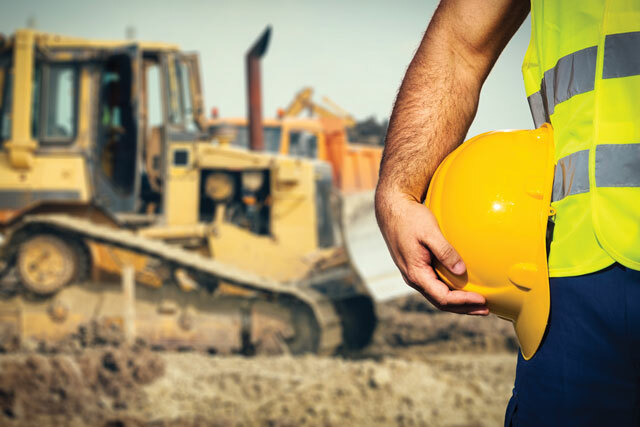 By region, total construction starts during the January-October period of 2017 revealed this pattern compared to a year ago – the Northeast, up 23%; the South Atlantic, up 3%; the West, up 2%; the South Central, down 5%; and the Midwest, down 12%. The 5% decline in the South Central reflected in part the comparison to last year that included $6.2 billion for two liquefied natural gas terminals, while the 12% decline in the Midwest reflected in part the comparison to last year that included the $3.8 billion Dakota Access pipeline and Chicago’s $900 million Wanda Vista tower. Read more articles from Dodge Data and Analytics here.